Ingredients: 5 Lemons & 1 litre of water. Directions: First cut the 5 lemons into half. Now you have 10 pieces of lemon. Squeeze out the juice of each piece in a container and you have your lemon peels ready. Now take 1 litre water in a container and bring it to boil. Add those lemon peels in that water and boil for 10 minutes. The lemon peel drink is ready. Transfer this into a jug or bottle and drink this 1 litre lemon peel drink throughout the day. You can have it warm or cold, as per your choice. * Rich source of Vitamin C.
You have to take this lemon peel drink continuously for one month. You can however start noticing difference from second week onwards. 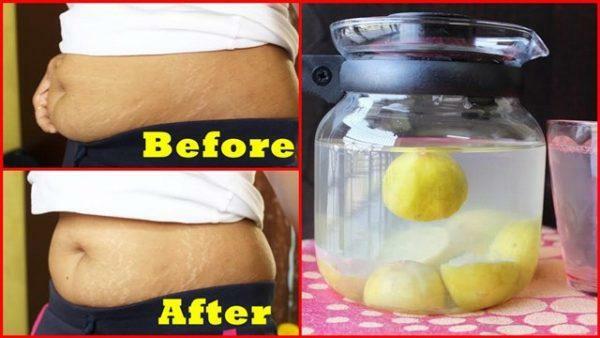 This lemon peel drink is 100% natural and very easy to make and it is very effective in losing weight. Note: The lemon peel drink is bitter in taste, that's the only one disadvantage of it.